One of the most common repair issues with ceiling fans is replacing a broken pullchain. It is not inevitable that someone will pull too hard, someone will attempt to be tarzan, etc and the chain will pull out of it's socket. In most cases the chain can not be reattached, however it is inexpensive and relatively simple to replace the socket and chain assembly. 1. Open the switch housing of the fan. This is usually achieved either by removing two screws on the bottom cap of the switch housing, or three screws on the side. Remove the pullchain assembly by unscrewing the brass finial on the outside of the switch housing. Black - L, Grey - 1, Brown - 2, Purple - 3. Some fans may use only two or three wires, some may have a pullchain with two layers and five or more wires. Regardless, make careful note of which wires attach where. 3. Remove the wires from the pullchain. In some cases they may be attached via wire nuts, in which case, remove the wire nuts. 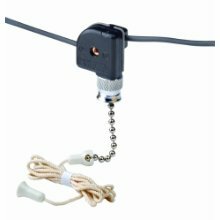 However in most fans the wires are inserted directly into the pullchain. Don't make the mistake of cutting them, they can be removed completely by inserting a very small flathead screwdriver into the slot next to each wire. You will notice the ends of the wires are soldered, this is so they will attach to the pullchain. If the fan has three speeds and the pullchain has four wires, it is most commonly a L-1-2-3 pullchain. This is a single pole triple throw switch with an off position. It connects the power from L to 1, 2, or 3 respectively, one for each speed. 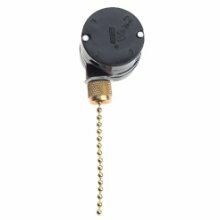 If the fan has three speeds and the pullchain has three wires, it is an L-1-2-1+2 pullchain. This is a single pole double throw switch with an off position and a "both" position. That is to say, in connects power from L to 1 or 2 respectively, and on the third position connects to both. This is the same switch used in many lamps to switch on one bulb (or set of bulbs), the other, or both. If the fan has two speeds and the pullchain has three wires, it is most commonly a L-1-2 pullchain. This is a single pole double throw switch with an off position. It connects the power from L to 1 or 2 respectively. If the fan has three speeds and the pullchain has more than four wires, there are a handful of different pullchain possibilities however most hardware stores stock the most common replacement. This would customarily be a double pole switch with two layers of wires attaching. If you can still switch speeds on the old pullchain, use an ohm-meter to check for continuity between the various wires on the various positions. In most cases the important relationships are between L and the various other positions, for example a three speed four wire switch might be L-1-2+3-3. This means in the first position L connects to 1, in the second position L to 2 and 3, in the third position L to 3, fourth position off. If you can not operate the switch, you can open up it's plastic casing, either to operate the switch by hand, or to observe the metal bands inside. Some websites that sell replacement switches offer diagrams of the metal bands, by matching your switch up to the diagram you can determine the correct replacement. 5. Ok, you've determined and obtained the correct replacement switch. Seeing as you made careful note of which wires connect to where on the old switch, reconnect the wires in the same manner to the replacement switch. If your old switch did not require the tips of the wires be soldered you may need to do so in order to properly attach them to the pullchain. 6. Reattach the pullchain to the switch housing and replace the finial. Replace the switch housing cap with the two or three screws. I. Fan lights where the pullchain is simply on/off use a two wire pullchain. This pullchain is a very standard on/off switch and it is simply connected to the two wires to which the old pullchain was connected. The wires can be reversed and it will still work. Lights where you can select one bulb, the other bulb, or both use the pullchain mentioned with that example above. When the pullchain reverses the fan or switches the speed control in and out of the circuit, it is most likely the three wire two speed pullchain mentioned above. It is a L-1-2 switch. There are some exceptions such as certain model Fasco fans. When the pullchain controls both the fan and light, it is the three wire three speed pullchain mentioned above. It is a L-1-2-1+2 switch. Pull Chain Light Fixture Not Working - How Do I Fix It? I have a Hampton Bay Ceiling Fan, and the pullchain for thel ight fixture is no longer working. How can I fix the pullchain? How do I replace my ceiling fan pullchain? This guide will explain to you how to do this in a step by step format, so that you are able to successfully replace your own ceiling fan pullchain. I have an older Concord ceiling fan. It was working fine, but recently the pullchain broke off at the switch. An electrician came and replaced the switch, he installed a 3 speed switch with three wires. He said there was one extra wire and didn't know what it was for.